City Connect » Featured » Fight the Frizz! 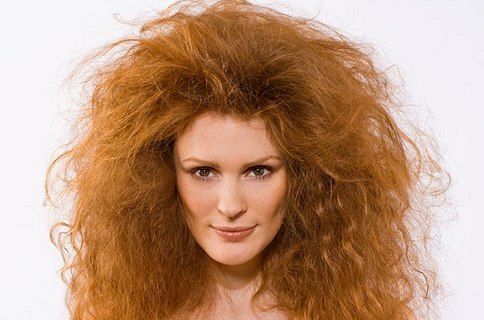 A couple of things you really don’t want to do with your frizz-prone locks, and a few you just might…. The very first memory I have of trying to tame my unruly locks came aged eleven, when attempting to straighten my hair using the discount iron my mum had bought a few weeks earlier from our local supermarket and an old, scratchy towel I somehow managed to burn a great big blister into my forehead, and quite badly I might add – ouch. Frustrated with my hair’s inability to lie flat for more than a couple of (very dry) days a month I decided to embrace the frizz and aged 12 purchased a crimping machine, yes you read correctly, I crimped. I’m not proud of it, nor do I recommend it to anyone save a follically challenged poodle. Olly Olly Olly, Oil Oil Oil! Olive Oil is cheap as chips and multi-tasking. Cook your sausages in it, rub it on your dry patches (as an alternative to expensive body butter) or even treat your tresses to a feed with it! I suggest popping a few tablespoons in a microwaveable bowl and zapping it for about a minute or so. When it has cooled a little carefully massage it through the mid-lengths and ends of your hair (the longer you leave it marinating the better), then a good wash and hey presto, baby soft tresses are yours! My hair just doesn’t behave the way it ought to if it doesn’t get a good night’s sleep every now and again (a bit like me then)! So to appease the hair gods I try and give it a rest from time to time by wearing it up in a top knot or a pony, in fact any kind of ‘up-do’ really just as long as it is tied back. Depending on the weather conditions (read: torrential rain) this does not always work but at the very least the exercise will have given you the opportunity to show off those fabulous cheekbones! Another good tip if your hair is long is to it tie it in a (comfortable) bun low on your head before you go to bed. If it’s anything like mine the next morning you might just wake to a full head of wondrously smooth waves which should stay put all day! Serum is a Girl’s Best Friend! Don’t get me wrong I like diamonds, but I can live without diamonds; I cannot, however, live without serum! And whether it’s from a supermarket or bought at a fancy hairdresser’s I find it’s pretty much all the same so don’t sweat the quality too much. But if you have frizzy hair and don’t use serum then you are doing your barnet a great disservice because it really does banish frizz in an instant (but may need topping up during the day so you’d be wise to stash one at work, in the car and anywhere you might need a quick top-up). Word of warning though – go easy with it, if you overdo it might all go a bit ‘chippy chic’! As any good frizz fighters know, besides maybe a scalp transplant there is not much you can do about frizz long-term. It is true to say that there have been days when I have seriously considered going all Demi Moore and whipping out the shaver, but then I remind myself that when I do have a good hair day it is a good day, and suddenly it all seems worth it and you forget that you ever spent hours straightening and re-straightening that wavy fringe (that your hairdresser talked you into, promising you that it was really cool and “just like Alexa’s”) and just enjoy it. Tagged beauty, hair, olive oil, serum. Bookmark the permalink.